Three years ago, Andre Burakovsky was in the postseason in Canadian juniors, a forward for the Erie Otters of the Ontario Hockey League. Since then, his career has been marked by a steep climb, making the Washington Capitals Opening Night roster for the 2014-2015 season at the age of 19 and finishing with nine goals and 22 points in 53 games. Then last season, he appeared in 79 games with 17 goals and 38 points. Not yet 22 years of age and taking the ice on Opening Night of the 2016-2017 season for his third NHL season, he scored a pair of goals against the defending Stanley Cup champion Pittsburgh Penguins. And then, a lot earlier than anyone might have expected, Burakovsky hit a wall. After scoring those two goals on Opening Night against the Penguins, he went his next 26 games without a goal. He had only eight assists in that span and was a minus-4. His ice time started drifting southward, finally settling under ten minutes in consecutive games at the end of that 26-game goalless streak. Was it ever. Over his next 25 games, starting with a two-point night (1-1-2) in his return to the lineup against the Philadelphia Flyers on December 21st, he was 9-10-19, plus-17. He, Lars Eller, and Brett Connolly made for an extremely effective third line. Against the Detroit Red Wings in that 25th game, though, he took a shot off his right hand that would lead to his missing another 15 games. Burakoivsky returned for the last 12 games of the regular season, but his scoring touch did not return with him. He recorded a single goal on 26 shots in those 12 games (he did have five assists). It made for an odd scoring distribution among his ten-game splits, his fifth split (Games 41-50) an impressive 5-7-12, accounting for more than a third of his season’s goals and points. It was an outlier of efficiency, with those five goals coming on just 18 shots (only the fourth-highest number of shots in any ten-game split for the season). It made for a frustrating and inconsistent season for Burakovsky. 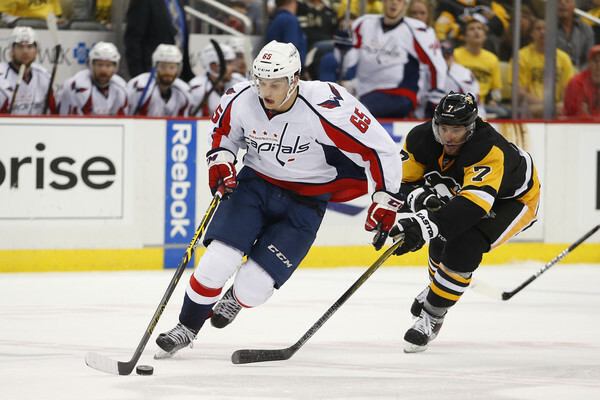 Fearless’ Take… Contributions from the bottom six matter, and Burakovsky was not an exception. In 11 games in which he recorded a goal, the Caps were 7-1-3, two of the extra time losses coming in the Gimmick. Washington was 21-2-3 in the 26 games in which he recorded a point. And being active was important, shooting-wise. In the 19 games in which he recorded at least three shots on goal in a game, Burakovsky was 14-2-3. Cheerless’ Take… Yeah cuz, but not shooting was something, too. In the dozen games in which he did not record a shot on goal, the Caps were 9-3-0. But here is the odd one. In the 18 games in which he skated at least 15 minutes, the Caps were just 9-6-3. And was there a player with a bigger disconnect between productivity and performance? Burakovsky had the best individual Corsi-for at 5-on-5 on the team (55.34 percent). And he, along with Eller and Connolly, had the fifth-best Corsi-for as a group (58.57 percent) among 78 forward combinations with at least 200 5-on-5 minutes (numbers from Corsica.hockey). But Burakovsky’s shooting percentage fell by almost three points (from 13.5 to 10.8 percent) from the 2015-2016 season. Odd Burakovsky Fact… We are not sure if Burakovsky was more “road warrior” or just unlucky at home, but he scored 10 of his 12 goals this season on the road, shooting 16.7 percent. He was just 2-for-51 shooting at home (3.9 percent) and did not have a goal at home after January 15th. What Tom Wilson was against the Chicago Blackhawks (four goals in two games), Andre Burakovsky was against the St. Louis Blues in the 2016-2017 season. In their first meeting of the season on November 23rd, Burakovsky recorded a pair of assists in a 4-3 win at Verizon Center. In the finale of the season series in St. Louis on January 19th, Burakovsky got the Caps started with a goal early in the first period on what would be his only shot on goal for the contest. It was a fine individual effort, taking a pass from Daniel Winnik as he entered the offensive zone, skated down the middle, curled off to his right and fired a shot that snuck under the glove of goalie Jake Allen. He added an assist on a Brett Connolly goal in the second period. Burakovsky finished 1-1-2, plus2, to finish the season series 1-3-4, plus-5, against the Blues. 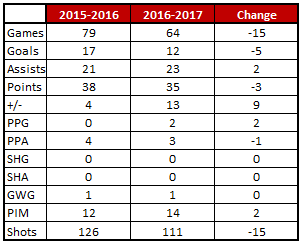 Burakovsky and the Red Wings were a bad matchup in the 2016-2017 season. He suffered the hand injury against Detroit in the second game between the clubs that caused him to miss 15 games, but he was also injured in the first meeting of the clubs back on November 18th. He skated just seven shifts in the first period before departing with an upper-body injury, one of three Caps forwards to suffer injuries in the first period of that game (Lars Eller and T.J. Oshie were the others, and none of the three returned to the game). The Caps did win that contest on a late goal from Jay Beagle, 1-0, but for Burakovsky it was part of a season in which he would be limited to a total of 9:55 in ice time over two games against Detroit. Even now, with the Capitals having been eliminated almost two weeks ago, Andre Burakovsky remains the top individual possession player of the postseason among 147 skaters with at least 100 5-on-5 minutes (64.84 percent; numbers from Corsica.hockey). He, along with Lars Eller and Tom Wilson, comprise still the top forward combination among 75 combinations with at least 25 5-on-5 minutes together (73.39 percent). So, are three goals and six points a reasonable reflection of the dominance Burakovsky displayed in his possession numbers, both individually and with teammates? Burakovsky had a hard time getting started in the postseason, not recording a goal in any of his first ten games of the playoffs (he had two assists). He did, however, record three goals over Games 5 and 6 in the second round against the Penguins (fittingly, given his road record this season, he had a two-goal game in Game 6 in Pittsburgh). However he, like the rest of the club, just couldn’t or didn’t answer the bell in Game 7, going without a point and with only a single shot on goal in the season-ending game. The 2016-2017 season was something of a step sideways for Andre Burakovsky. Injuries and lackluster play caused him to miss 18 games, and his production when in the lineup was uneven. Then there was the disconnect between his superior possession numbers and the performance-based numbers of goal, assists, and points, a disconnect exacerbated in the postseason. It made for an odd season that seemed to resemble a queer (to use Melville’s term) practical joke of sorts. But Burakovsky remains a player who has yet to complete 200 regular season games in the NHL (he has 196), and finding a way to align performance with his production numbers is now an important item on Burakovsky’s learning “to-do” list.